Need a storyteller for your next event? I am now scheduling performances and workshops for spring and summer 2015. I am available for preschool groups, teacher or youth workshops, literacy programs, birthday parties, carnivals and more. I offer a wide variety of themes and costumed characters. Email me at sdstorymom@gmail.com for rates and information. 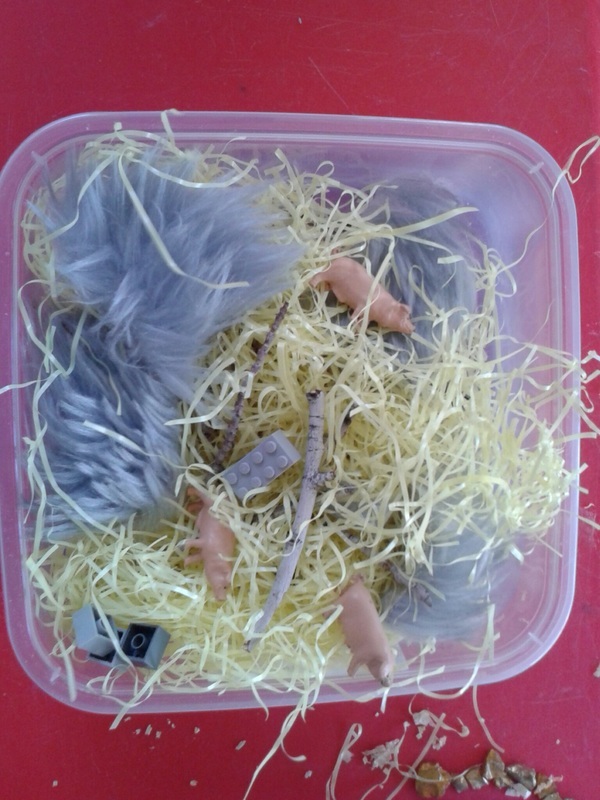 Here are some of the sensory bins I put together for my recent workshop. These are mini size bins for display. 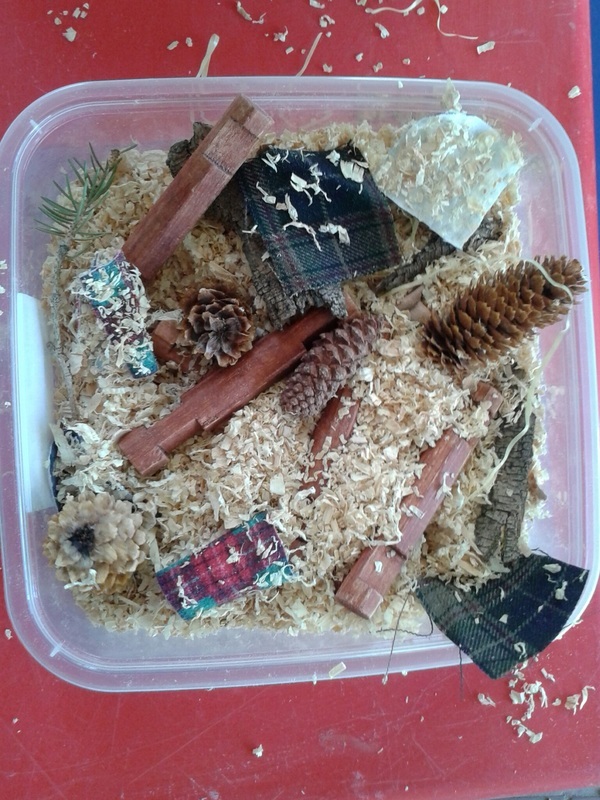 They are perfect for individual play/ therapy but can be made in larger containers for more children to play at once. I bought these containers at the dollar store, and I love them because they're a nice size and have really durable lids that stay put, so they're really portable. These bins are super easy to put together, and kids can even help come up with their own ideas and help gather materials. How cool would this be for a book report project? This year I have the opportunity to teach a workshop at the annual conference for the Utah Association for the Education of Young Children (UAEYC). My class is about sensory storytelling, and you can download the class handout here. Stay tuned for ideas and pictures about sensory story bins. Today I got to participate in the WSU storytelling festival, which is always one of my favorite events. I told fables with fellow regional tellers, Kim and Carol. I also got a chance to tell in the same session with Pippa White, who told inspiring true stories of the Orphan Train riders. In the afternoon I told at a school outreach assembly with Cherie Davis. 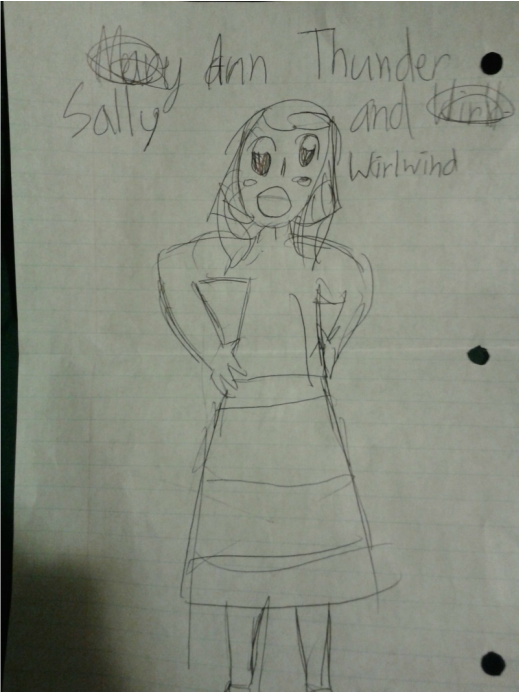 One of the students in my session drew this picture of the story I told and gave it to me afterward. She did the same for the other tellers too, and I thought it was really sweet. I am excited to be presenting at the UAEYC Early Childhood Conference tomorrow, and I have made some handouts for my workshop on storytelling to enhance learning and development. You can download my Storytelling Resources Page here. Would you like to create a story-based unit for your classroom? Use this easy planning worksheet. As a storyteller, promoting literacy is a major goal of mine, especially for my own children. One of the best ways to keep kids sharp through the summer and avoid the "summer slide" is consistent daily reading. I put together these simple reading charts to help track progress and keep my kids motivated. They are free to download for personal use, but please do not redistribute. If you wish to share, just link back to this site. Click on the pictures above to download each version. You can also grab the pink chart here and the red chart here. Each chart has 100 spaces. You can have children read a certain number of minutes or pages to mark off each space or just mark one for each book read. The randomly-spaced stars are meant for small prizes, and the final space earns a large prize. 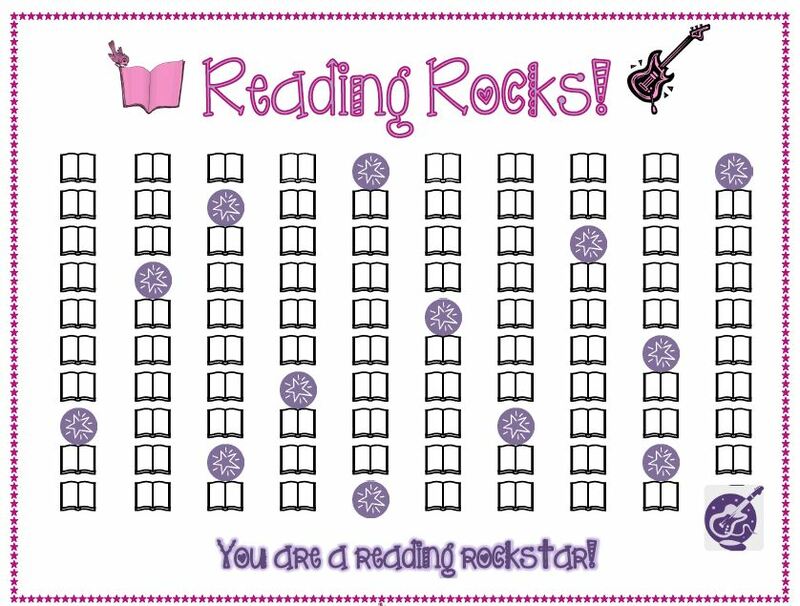 FONT CREDITS: For the "Reading Rocks" chart I used KG Only Hope by Kimberly Geswein. 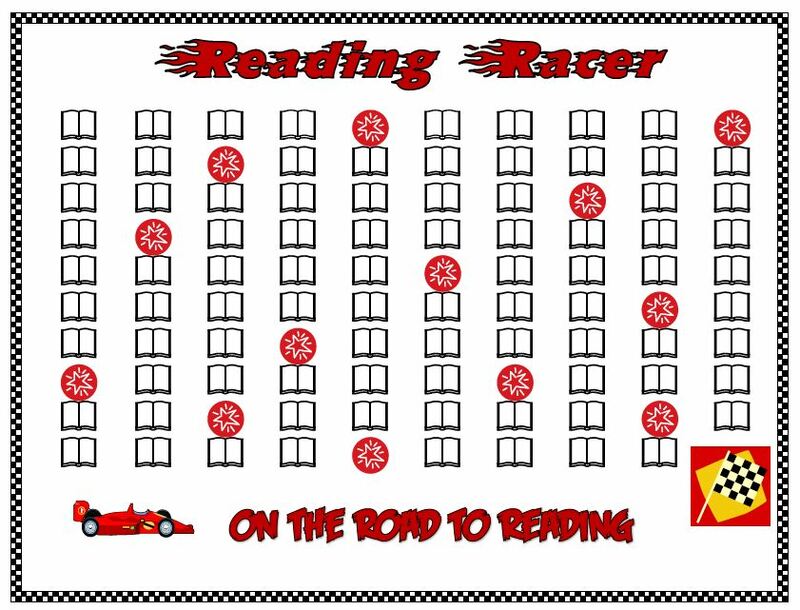 For the "Reading Racer" chart I used Blazed by Bright Ideas and Feast of Flesh by Nate Piekos. Ok, I admit it. I have become obsessed with Pinterest lately. 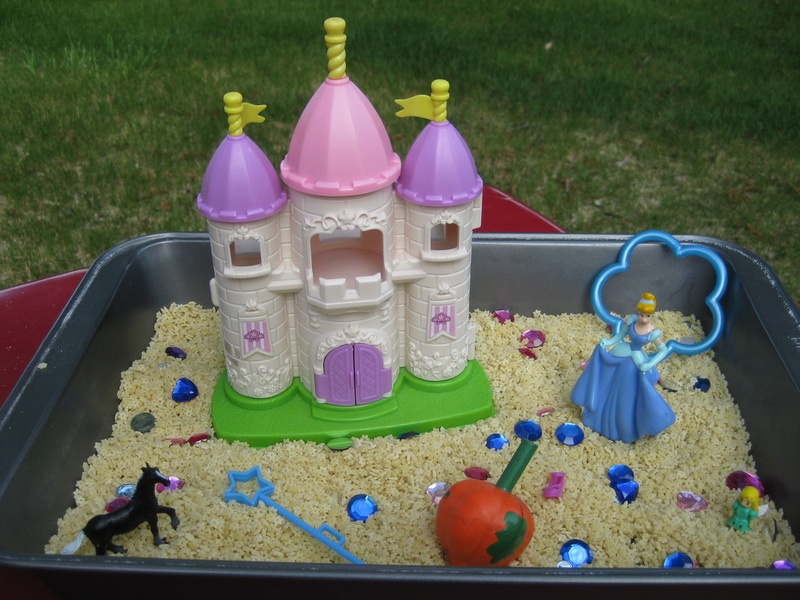 In my quest to find tactile activities for my blind daughter, I have found a plethora of really great sensory bin ideas, which inspired me to create my own based on my love of stories. Of course, my first bin had to be centered on our all-time favorite fairy tale around here, Cinderella. 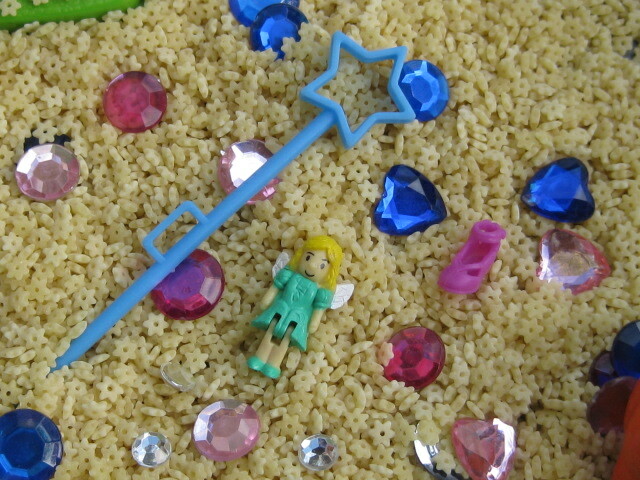 Cinderella sensory bin: Star pasta, plastic gems, miniature wand, tiny fairy doll, and a doll shoe. Last week I was able to be part of the Weber State Storytelling Festival for my third year. I told to a group of third graders on Tuesday morning, and the audience was great. The national teller in my session was Beth Horner, and she was so friendly and gracious. She is an amazingly talented storyteller, and such a nice person. I shared a folktale about the "Girl with a Million Excuses," and Beth told a simultaneously terrifying and hilarious personal tale about the day her heroic brother faced down the menacing buck sheep, and (barely) lived to tell about it. I also got to do a school outreach program at Boulton Elementary for the upper-grade students. The kids were really great audience members, joining in to help me tell "The Fat Cat." I also shared my (mostly) true story of my run-in with a rogue pair of dentures. We also got the chance to enjoy the preschool story hour at Treehouse Children's Museum and one of the family concerts Monday evening. It was a great festival. If you have never had the chance to attend, you really should try to catch it next year! Last night my family was able to visit the Christmas Village in Ogden, which has become one of our family traditions. This year, storytelling has become part of the celebration. The United Way, along with Lifetime Products, is sponsoring a Stories for a Lifetime tent where visitors can warm up and enjoy some wintry tales. Volunteer readers and storytellers will be in the tent every evening from 5-8p.m. either reading storybooks or telling holiday tales. Lifetime Products has donated some wonderful chairs so listeners can get comfy as they enjoy the stories. The United Way is also giving away wrapped books for each child who visits the tent as part of their effort to promote literacy in our community. I had a lot of fun last night, entertaining listeners of all ages. I usually only had one or two families at a time, so all the children were able to be involved. The highlight of the evening for me was when a group of college-aged young men walked in. I think they were just trying to get warm, and they saw the inviting lights of the tent, so they came on in. "Dude, is this story time?" I hadn't quite prepared for that particular demographic, so I had to think quickly to find something in my repetoire they might enjoy. Though it didn't exactly fit with the holiday theme, I told my best liar's tale, "Granny's Grin." With such a small group, I was really able to interact with the audience members, and it made the story come alive. Sometimes when I tell something I have told a lot, I slip into "recitation mode," and it sounds stiff and rehearsed, so it was nice to really be able to connect with my listeners. All these tough guys were engaged and laughing through the whole story. Afterward, they all clapped and told me it was awesome! It was really fun to show them that stories aren't just for little kids. The storytelling tent will be available every evening, so stop by for some stories and a free book. While you are there, you can see the lights, catch some free entertainment, enjoy some hot chocolate, and even visit Santa Claus. Watch my site for details to find out what dates and times I will be telling. On Monday, Dec. 3, I was able to be part of the first Kneaders Night for the 2012 holiday season, along with several other tellers from the Utah Storytelling Guild. During the month of December, Kneaders is offering fun activities for families on Monday nights. The kick-off event was a Gingerbread Man storytelling night. Professional storytellers entertained lucky diners at each Kneaders location throughout the state, and listeners enjoyed free gingerbread cookies along with the stories. I had so much fun at the Layton store. I would like to thank the manager, Riley Booth for making me feel so welcome, and I also want to thank everyone who attended. There were several families there with small children, and they all seemed to have a good time. We sang, laughed, and even had learned some American Sign Language. If you missed this event, be sure to visit you local Kneaders on Dec. 10th for french toast with Santa Claus! The last Kneaders Night will be an Elf on the Shelf activity on Dec. 17th. Be sure to pick up some gingerbread cookies while you are there!